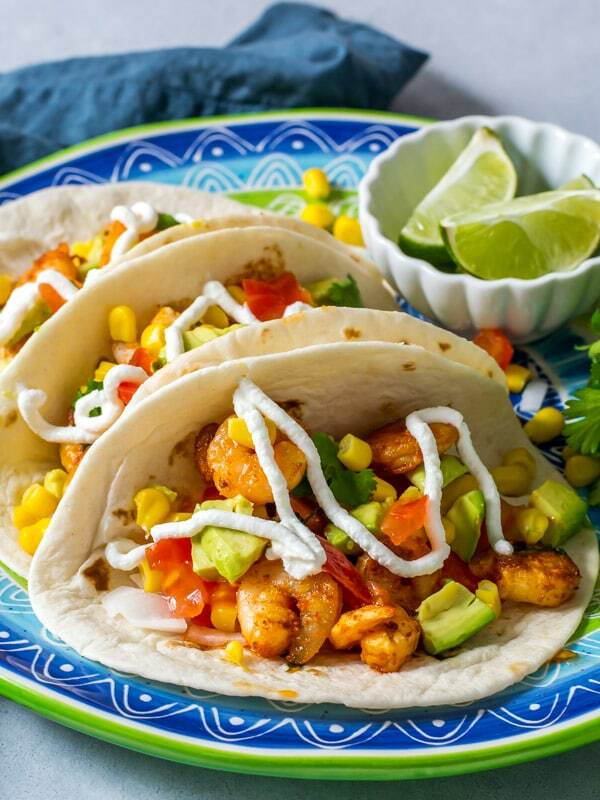 These delicious shrimp tacos are a crowd favorite and easy to make – consider it done in 30 minutes. It is perfect for those who love to entertain but don’t want to spend a lot of time in the kitchen. Watching the Big Game with friends has its own charm. It is so much fun to have friends over, share a meal and watch the action (or commercials) together. No party would be complete without food but planning a delicious, nutritious meal that all your friends will enjoy can get challenging. There is a simple solution – make it a Taco night. Tacos are perfect for small groups or large ones, adults or with kids – that’s because you can customize it very easily to suit individual tastes. While this recipe calls for shrimp, feel free to replace it with chicken or any other meat of your choice. You can also include a vegetarian option by using paneer (cottage cheese cubes) or potatoes instead. This way you are catering to both meat eaters and vegetarians. As for the kids, if you think a cheese pizza is the only option, think again. Let them join in the fun and make their own taco – a nutritious option as well. 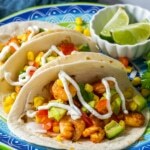 How to make Shrimp Tacos? Game nights are known for greasy, deep-fried food and that doesn’t bode well for those who have made a resolution to eat healthy during the New years. And the fact is shrimp tacos can be calorie dense especially if you load it with cheese and sour cream. That’s why we’ll do neither. 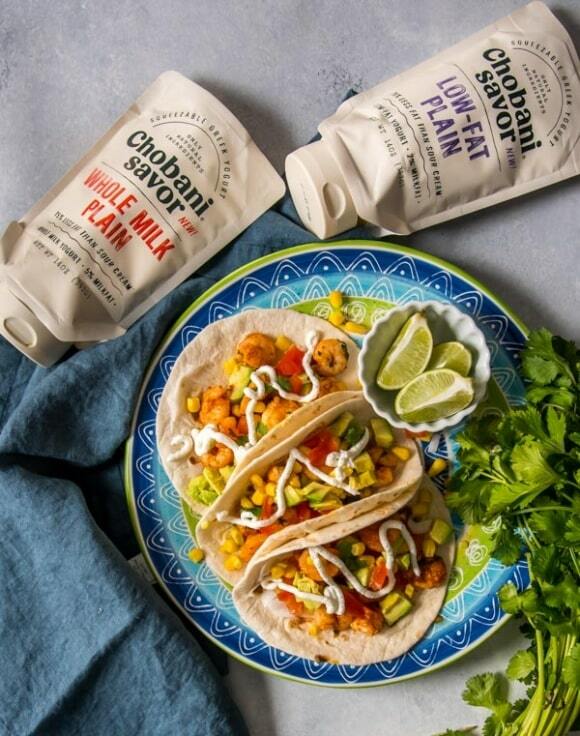 We’ll skip the cheese and swap sour cream with Chobani® Savor™ Whole Milk Plain Greek Yogurt Topper – a sour cream alternative made from the same delicious Chobani® Plain Greek Yogurt that we all love. Is it okay to substitute sour cream with Greek yogurt? Why do we love Chobani® Savor™ topper? Chobani® Savor™ Topper, made from delicious Chobani® Plain Greek Yogurt, is a smart alternative to sour cream. It has fewer calories with the same great taste. For example – Chobani® Savor™ contains an average of 25 calories while sour cream has 60 calories per 2 tablespoon serving. Chobani® Savor™: avg. 25 calories; sour cream: 60 calories per 2 tbsp serving. Chobani® Savor™ Topper has a rich and creamy texture that is both nutritious and delicious. Also, Chobani® Savor™ Topper comes in a resealable squeeze pouch that is easy to use. That means less mess to clean! 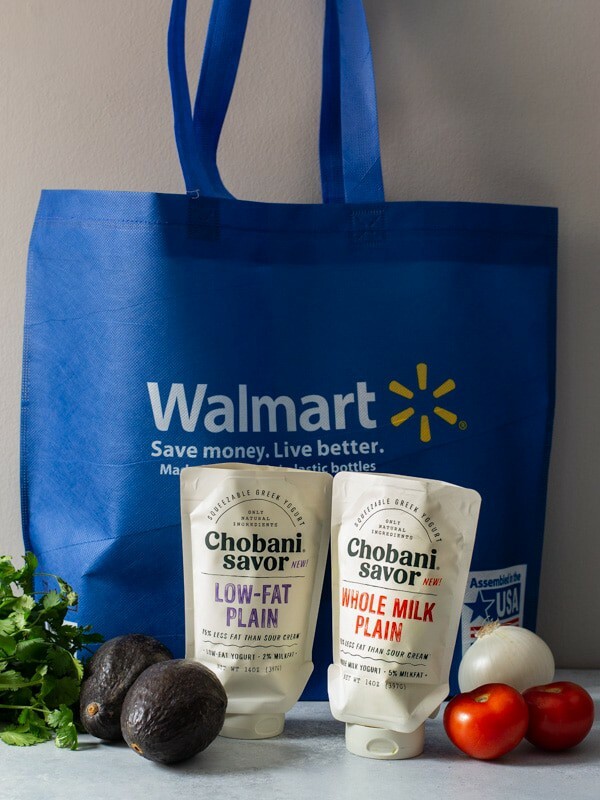 Find Chobani® Savor™ Topper with all of your favorite Chobani® products in the yogurt aisle at Walmart. Heat oil over medium heat. Add shrimp and cook for 5-6 minutes until done. Add lime juice and cilantro to the shrimp. Mix well and set aside. Warm the pre-cooked tortillas on a pan. Set it aside. Assemble the taco – place the tortillas, add corn, chopped onions, tomatoes, avocados, and shrimp. Top it with Chobani® Savor™ Topper. Add cumin powder – add 1/4 teaspoon cumin powder along with chili powder while sauteing shrimp. Add hot sauce as a topping – This recipe is low on heat. Include hot sauce or pepper sauce to amp it up. Top it up with shredded Mexican blend cheese. Replace shrimp with chicken or any other meat. Use guacamole instead of chopped avocados. To make it vegetarian – replace shrimp with sauteed potatoes or paneer (cottage cheese cubes). Buy peeled, deveined shrimp will save you a ton of time. To prevent chopped avocados from browning, squeeze lime juice over it. 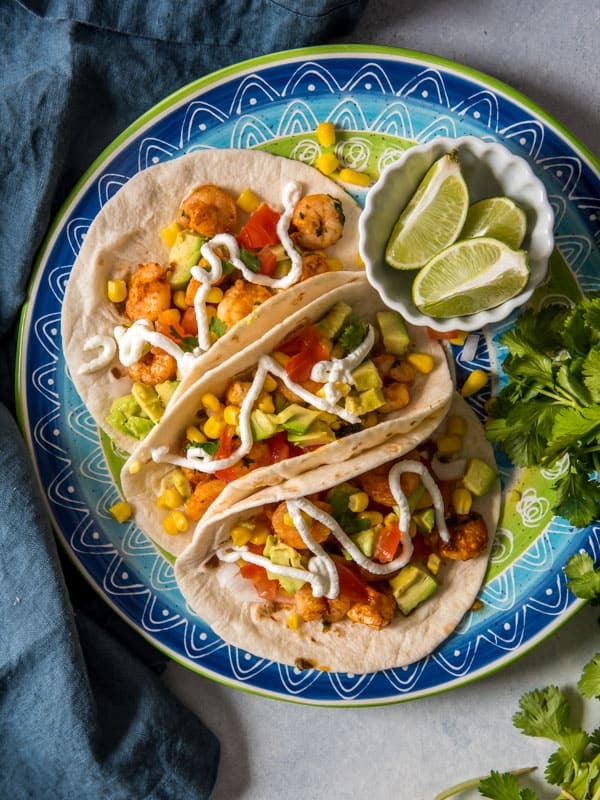 These delicious shrimp tacos are a crowd favorite and easy to make - consider it done in 30 minutes. It is perfect for those who love to entertain but don't want to spend a lot of time in the kitchen. Assemble the taco - place the tortillas, add corn, chopped onions, tomatoes, avocados, and shrimp. Top it with Chobani® Savor™ Whole Milk Plain Greek Yogurt topper and serve immediately. Buy peeled, deveined shrimp to save you a ton of time.